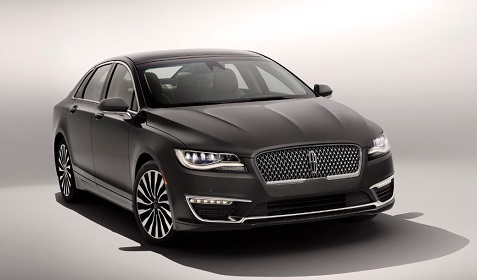 Lincoln completely redesigned the mid-size MKZ sedan for the 2014 model year, and now that design gets a completely new front end with Lincoln’s all-new, one-piece signature grille that debuted on the all-new Continental. You can see from the photos of the new MKZ above that the grille fits nicely with the vehicle’s overall design and gives it a more traditional and distinguished look compared to the previous model pictured below. I like the previous design as well, as Lincoln was in the midst of upping its game from a design point of view with the dramatic front end, but the new look fits the traditional Lincoln brand well. Another important evolution with the 2017 model is available under the hood. The 2017 Lincoln MKZ comes with the option of an all-new, Lincoln-exclusive 3.0-liter GTDI V6. When paired with an intelligent all-wheel-drive system, the twin-turbocharged engine produces 400 horsepower and 400 lb.-ft. of torque, which should improve the overall driving performance of the vehicle. I’ve driven the previous model extensively and this new engine option will likely make a big difference. The new Lincoln MKZ has many advanced driving features consumers expect from modern luxury vehicles, including available adaptive cruise control with stop-and-go functionality. The system activates the brakes automatically to bring the car to a complete stop if the driver fails to apply brakes in time. To assist with annoying stop-and-go driving, an auto-hold feature keeps the car at a complete stop without the driver having to press and hold the brake pedal. Other features include available Enhanced Park Assist and Pre-Collision Assist with Pedestrian Detection. With the new front-end styling and engine options that include a hybrid, the MKZ should continue to be a very valuable vehicle in the Lincoln lineup. We’re looking forward to driving it! Lincoln is bringing back the iconic Continental name for its new flagship sedan for the 2017 model year. The full-size, luxury sedan will be available in the fall of 2017 in the US and China. Lincoln’s new signature grille grabs your attention immediately as the most distinctive feature of the new Continental. It will be interesting to see how this new grille starts to impact the design of other models in the Lincoln line-up, as it’s such a departure from the more modern and stylized grille currently dominating Lincoln designs. This new grille offers a more classic and traditional look. It’s elegant and appropriate for a luxury line, and it may be representative of the design direction Lincoln needs to follow to reclaim its traditional place among the top luxury brands in the US. I’ve heard some feedback that the new look is too similar to other luxury brands like Bentley, and while that may be a fair criticism, the new front end certainly looks good on this new vehicle. 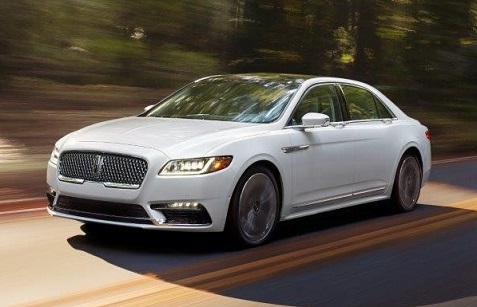 Lincoln is stressing all of the luxury and comfort offered by the new Continental, but I’m most interested in the all-new Lincoln-exclusive 3.0-liter V6 engine with twin turbochargers that produces a projected 400 horsepower and 400 lb.-ft. of torque. We can see from the photos that the new design is worthy of the Continental name, so I’m anxious to drive the vehicle and see of the entire experience lives up to that standard as well. Lincoln Motor Company’s transformation takes a major step forward with the unveiling of the all-new 2015 Lincoln MKC small premium utility vehicle, and we had the opportunity to test drive this attractive vehicle. There is no doubt that when you first see the MKC, her appealing design really stands out. 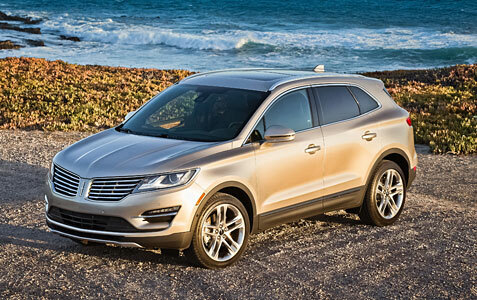 The 2015 Lincoln MKC is striking from all angles and clearly has the right look to succeed in a very crowded market. The MKC presents a sleek, sculpted body that helps it stand out among peers. Its high beltline and low shoulders create a sturdy, athletic presence, while features such as soft exterior lighting, pedestal side-view mirrors and an available panoramic, all-glass Vista Roof give the vehicle a luxurious, sophisticated personality. Our ruby red metallic MKC looked sleek with 19-inch, five-spoke wheels. From its signature split-wing grille, to its uniquely crafted, hands-free wraparound liftgate, the Lincoln DNA is evident and showing great confidence in this new offering! MKC will greet owners with exclusive Approach Detection, which senses when an owner is near and responds by illuminating “welcome mats” on the ground next to both front doors. Simultaneously, headlamps, taillamps and door handles glow with soft lighting tuned to complement the vehicle’s exterior color. The unique design also carries through to the interior, where craftsmanship and high-tech combine to offer a warm, luxurious environment. An architecturally unique instrument panel showcases Lincoln’s signature push-button gear shifter, which provides an open, inviting interior space. Plush leathers with French stitching and available Bridge of Weir leather and real wood trim accentuate MKC’s elegance and grace. To be more consistent with the Lincoln driving experience, an all-new Lincoln steering wheel debuts on MKC and will be available on all future Lincoln vehicles. This highly tactile, leather-wrapped wheel provides better feeling and control and puts the brand’s new design DNA in the driver’s hands. The enhanced THX II Certified Audio System, an industry-first featuring THX-distributed bass technology and 14 right-, center- and left-slot speaker assemblies, is available. The state-of-the-art audio system delivers a rich, immersive surround sound experience that reproduces music as it was mixed in the studio. SYNC with MyLincoln Touch enables drivers to personalize MKC by using voice-activated commands or simple touch controls on the class-exclusive 8-inch touch screen. Knobs and buttons on the center console provide additional and easy access to control the air conditioning and sound system.